BAGHDAD (AP) - Baghdad's decade-old nightly curfew ended after midnight Sunday, hours after bombs exploded in and around the Iraqi capital, killing at least 40 people in a stark warning of the dangers still ahead in this country under attack by the Islamic State group. The deadliest of Saturday's bombings happened in the capital's New Baghdad neighborhood, where a suicide bomber detonated his explosives in a street filled with hardware stores and a restaurant, killing 22 people, police said. "The restaurant was full of young people, children and women when the suicide bomber blew himself up," witness Mohamed Saeed said. "Many got killed." The Islamic State group later claimed responsibility for the attack, saying their bomber targeted Shiites, according to the SITE Intelligence Group, a U.S.-based terrorism monitor. The Sunni extremist militants now hold a third of both Iraq and neighboring Syria in their self-declared caliphate." "Sending arms to Ukraine will not scare Vladimir Putin, warns Angela Merkel while Francois Hollande warns it could lead to war"
"It was a day of bluster and speeches but also paralysis over how to bring the bloodshed in eastern Ukraine to an end. On one side, hawks in Washington favour supplying “advanced weapons” to Ukraine’s government in Kiev. On the other, cautious European leaders warned it is easier to provoke Vladimir Putin than to scare him. “I am firmly convinced this conflict cannot be solved with military means,” said Angela Merkel, the German chancellor at the Munich Security Conference. Mrs Merkel, who is the only major Western leader to have a working relationship with Mr Putin, said a flow of American arms to Ukraine would not intimidate the Russian leader. In the Southeast the Armed Forces of Ukraine are defeated again. The adventurous attack of the Ukrainian forces in Donetsk was interrupted and totally wrecked by the militia. A huge group of the Ukrainian troops got into a trap near Debaltsevo. And it can be eliminated soon. The price of "the Blitzkrieg" is heavy: during two last weeks the Armed Forces of Ukraine have lost 1100 soldiers, above 100 tanks. Dozens of soldiers and officers have been captured by the guardians of Donbass. Now these scary numbers are the greatest secrets of the Kiev junta. The leadership of the National Security and Defense Council, the Ministry of Defense and the President Poroshenko spare no efforts to convince public opinion of Ukraine that “there are no casualties”, “enemy is defeated”, and “thousands of terrorists are eliminated”. But the reality is different: the forces are demoralized and surrender, there are no reserves, mobilization makes no progress, and conscripts run away to Russia and to the West. The leadership of the so-called Antiterrorist Operation is in panic, it makes crazy orders, forms anti-retreat forces in a rear, send unskilled recruits to attack highly-trained militia’s defense. At the same time criminal commanders are first to run from the battlefield and prosecutors make for themselves certificates of warfare participants and get benefits for it. Moreover, the population of the nearby combat territories suffers from deserters and looters, maniacs and murderers wearing uniform of the Ukrainian Armed Forces! "CHICAGO (AP) - Six Bosnian immigrants accused of sending money and military equipment to extremist groups in Syria used Facebook, PayPal and other readily available services to communicate and transfer funds, according to a federal indictment. All are charged with conspiring to provide and providing material support to groups designated by the U.S. as foreign terrorist organizations, including the Islamic State group and an al-Qaida-affiliated rebel group known as the Nusra Front. The indictment unsealed Friday in U.S. District Court in St. Louis alleges they plotted by phone, Facebook and email; shared videos and photos related to their plans on social media sites; sent money via PayPal and Western Union; and shipped boxes of military gear through the U.S. Postal Service." "Russian President Vladimir Putin said on Saturday Russia did not plan to wage war on anyone, although a world order where one leader tells others what they can do would not suit Moscow. His comments were the first from Putin since he met French President Francois Hollande and German Chancellor Angela Merkel on the crisis in the Ukraine on Friday. "There clearly is an attempt to restrain our development with different means. There is an attempt to freeze the existing world order ... with one incontestable leader who wants to remain as such thinking he is allowed everything while others are only allowed what he allows and only in his interests," Putin said. "This world order will never suit Russia But we are not going to wage war on anyone, we are going to cooperate with all," he said during a meeting with labour unions in the southern city of Sochi." 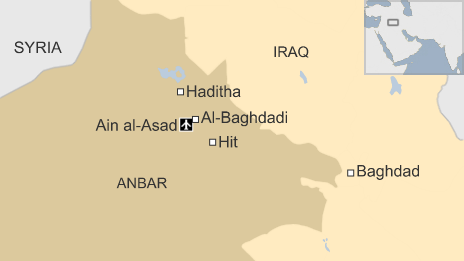 Al-Baghdadi, about 85 km (50 miles) northwest of Ramadi in Anbar province, had been besieged for months by the radical Sunni Islamist militants who captured vast swathes of Iraq's north and west last year. The officials said another group of insurgents then attacked the heavily-guarded Ain al-Asad air base five km southwest of the town, but were unable to break into it." "Navy wife Lori Volkman has received a series of messages on her Facebook account from “ISIS sympathizers” warning that while her husband was off fighting the Islamic State, they were coming for her. “We know everything about you, your husband and your children and we’re much closer than you can even imagine,” they wrote." talk about despicable I don't care who's responsible, this is just wrong in so many ways! "Jihadist militants from Islamic State (IS) have burned to death 45 people in the western Iraqi town of al-Baghdadi, the local police chief says. Exactly who these people were and why they were killed is not clear, but Col Qasim al-Obeidi said he believed some were members of the security forces. Col Obeidi said a compound that houses the families of security personnel and local officials was now under attack. He pleaded for help from the government and the international community. The fighting and poor communications in the area make it difficult to confirm such reports. Earlier this month, IS published a video showing militants burning alive a Jordanian air force pilot, whose plane crashed in Syria in December." "BERLIN: Police in the German city of Braunschweig cancelled a popular carnival street parade on Sunday because of fears of an imminent Islamist terror attack. Police spokesman Thomas Geese said police received credible information that there was a "concrete threat of an attack with an Islamist background" on Sunday's parade and called on all visitors to stay at home." "CAIRO — In retaliation for the gruesome killing of Egyptian Christians on a beach in Libya, Egypt sent its air force on the attack against Islamic State targets there Monday, in a move that threatened to ensnare Egypt in a regional conflict with the militants. Egypt’s Foreign Ministry on Monday called on the U.S.-led coalition striking Islamic State targets in Syria and Iraq to broaden its scope to North Africa and take action against the extremist group in Libya. Italy said it would weigh a military intervention in its former colony across the Mediterranean to thwart the Islamic State. Libya’s air force also said that it had launched raids against militants in eastern Libya in coordination with Egypt and that the strikes had killed more than 60 fighters. 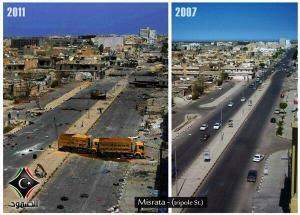 The chief of staff for Libya’s air force told Egyptian state television that the raids would continue Tuesday." The Russian Defense Ministry's TV channel has released video footage taken from a Tu-95 strategic bomber as it was shadowed by RAF Fighter Typhoon jets. The video features engines that appear to be stalling. The video compilation published on Wednesday by the Zvezda channel was shot from one of the Tupolev Tu-95 “Bear” bombers as it was flying on a mission in international airspace close to the United Kingdom. The turboprop bomber is seen being escorted closely by several NATO fighter jets scrambled to intercept it. One is easily identified by its tail code “FB” as an RAF Eurofigher Typhoon from the Lossiemouth airbase. 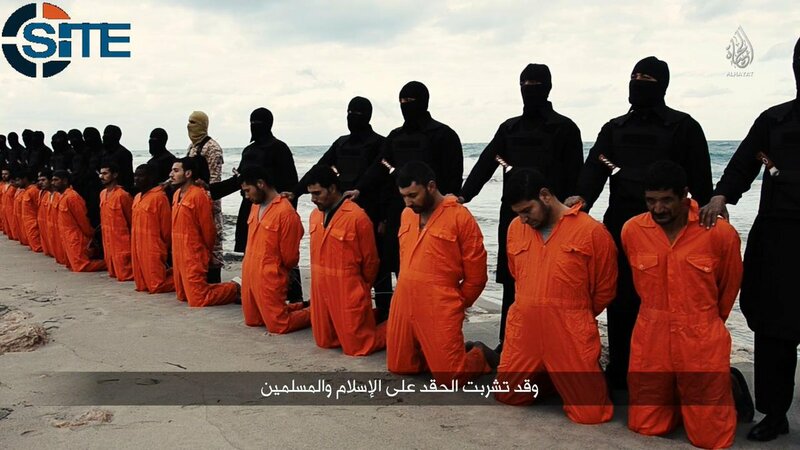 OK, so ISIS - or a group loyal to ISIS - set up a beheading party on a popular fishing spot in Tripoli, Libya, called Wilayat Tarabulus, to simultaneously behead 21 Egyptian christians. Shortly after, Egypt started bombing ISIS. One might be able to inticipate what nationality the next victims might have based on what countries are yet not fighting ISIS. "The whole look and feel of video displays an ‘unreality’ of reality, using captions, heavily edited horror images and clever sound techniques - that can only be described as a psychic assault on the viewer. In the final minutes of the video, the camera quickly cuts back and forth across the screen with a tight low-level camera angle and quick cut editing, appearing to show a mass beheading. However, much of the scene displays signs of flashy post-production mixing in natural less controlled sound with music and some positional audio layered together to make the scene appear authentic. We never actually witness a full sequence of a ‘beheading’ as the camera jolts away from one apparent death scene to the next – without any significant arterial blood spurting." "On Tuesday, Jordanian officials said they learned that the pilot had actually been killed on Jan. 3"
According to Bloomberg’s, on Feb 10 the UN Security Council adopted a binding Russian resolution threatening economic and diplomatic sanctions against countries and individuals that help ISIS and other terrorist groups profit from trading oil, antiquities or hostages. As the US vetoes most Russian Security Council resolutions, this was an historic event. The resolution requires governments to ensure that they aren’t engaged in direct or indirect trade with ISIS and al-Qaeda-affiliated groups such as the al-Nusra Front in Syria. According to Bloomberg’s, the resolution will significantly impact Turkey and Syria, which allow the purchase of oil from the militant group. Facts the article omits are probably more significant than the omissions. First Bloomberg’s neglects to mention that the US initially opposed the resolution and spent three days frantically trying to counter and/or change the draft language. Presumably this relates to inconvenient truth that Israel is one of the main destinations of the smuggled oil. Thirdly it (deliberately?) leaves Israel and unnamed EU nations off the list of countries buying oil from ISIS. The text of the resolution, which stops short of threatening the use of force, urges governments to share information on ISIS financing networks, bans exports of all antiquities from Syria and reiterates the call on countries to prevent ISIS from benefiting from political concessions or ransom payments made to secure the release of hostages. "(Reuters) - Islamic State militants have abducted at least 150 people from Assyrian Christian villages in northeastern Syria they had raided, Christian Syrian activists said on Tuesday. A Syrian Christian group representing several NGO's inside and outside the country said it had verified at least 150 people missing, including women and elderly, who had been kidnapped by the militants. "We have verified at least 150 people who have been adducted from sources on the ground," Bassam Ishak, President of theSyriac National Council of Syria, whose family itself is from Hasaka, told Reuters from Amman. Earlier the British-based Syrian Observatory for Human Rights said 90 were abducted when the militants carried out dawn raids on rural villages inhabited by the ancient Christian minority west of Hasaka, a city mainly held by the Kurds." The Channel 2 report said the Saudi ministers have relayed this message in private to European sources. "In private talks with European sources, the Saudis have expressed their willingness to cooperate with Israel on Iran, including use of Saudi air space by the IDF for a possible air strike, according to a report by Channel 2. Arab governments, not only Israel, have been expressing concern over the development of a deal with Iran over its nuclear program, the Wall Street Journal reported Friday. Talks with Iran over its nuclear program have instilled fear within some major Sunni states, such as Saudi Arabia, Egypt, Qatar, and the United Arab Emirates that a nuclear arms race will break out in the region, and brought about speculation regarding the possible extension of a US nuclear umbrella to its non-nuclear-armed Middle East allies." 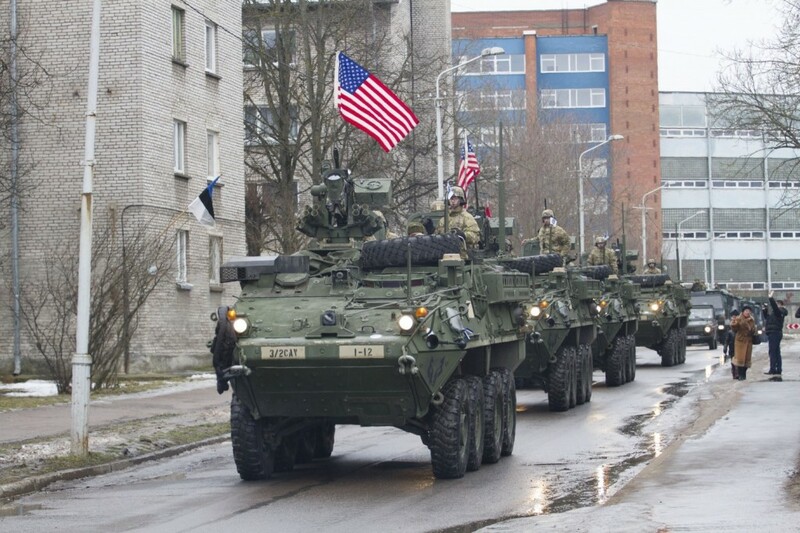 "Vilnius (AFP) - Lithuania announced on Tuesday it would return to limited conscription later this year as concern mounts over Russian military exercises near NATO Baltic states." It wouldn't be the first time now would it? The article goes a long way to remind the reader of past occurrences to substantiate it's claim. As such it's a list of boundary stones delimiting the curriculum of Oriental propaganda. That in itself makes it a keeper. I haven't been able to find a secondary source to the claim coming out of FARS but hey, when a news agency - like Reuters - says so, it just has to be true, no? If nothing else the link goes to show the heavy propaganda coming out of these agencies of popular sentiment. That said, I have a strong feeling certain events are being slightly underreported in Western MSM, if not totally distorted. Maybe the absence of pictures and official statements in the article provides the only negative documentation of the event actually taking place, meaning since it's not overreported in MSM it has to be true? Who cares anyway? We know the truth is a lie concocted on a base of tradition, accepted falsehoods, and personal experience through mass media. Anything can come out of a news agency and become truth in a couple of hours. All you need is a talking head and a green-screen. Oh, and YouTube account. News agencies these days I think should be called ooze-agencies. Ooze-agencies are profligate, exuding a sticky truth that slowly permeates every frame of mind until a new paradigm has been established with free thinking eradicated. I can't remember public debates ever being so high-pitched and irrational but then again, I wasn't around in the 30's. Or the 40's. Or the 50's. Or the 60's. Or just forget about it. Sometimes I think this is just how it is, and it is never going to change. F5, F5, F5 - no, still crap. In the video below you can see a long column of military vehicles, including tanks and armored cars. This column, according to the caption, was filmed on 23 February in the border city of Narva, Estonia, The city is located on a reservoir that provides St. Petersburg [electric] power. What is striking about these images is that this military convoy is openly displayed to the public. Some vehicles are harboring US flags. 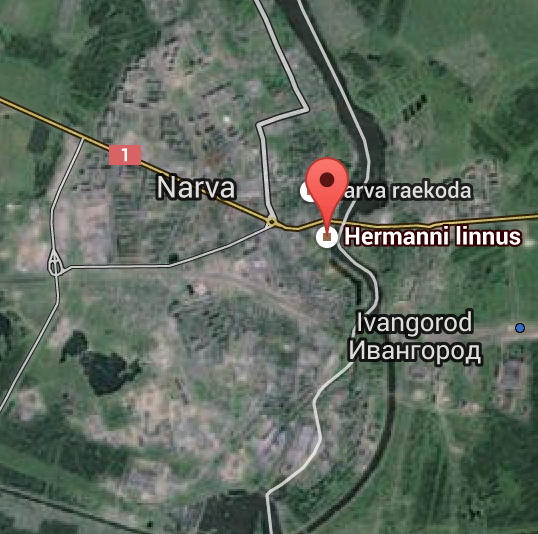 The convoy is crossing the city [of Narva within less than a kilometer from the Russian border]. It can be filmed by anybody. [Note the picture below, Estonia on the left. Russia on the right on the other side of the bridge]. You can imagine how Putin might feel in this regard, [a US-NATO convoy] close to his former power base of Saint Petersburg. That might well be the underlying intent [of this military convoy]. This may be part of a major NATO exercise to be held in the area. The Netherlands is also involved. Of course, NATO military exercises can occur anywhere. But why specifically are they taking place in Estonia [at Russia's doorstep]? And why are they displaying American flags right on the Russian border? And why now, with the resurgence of war in Ukraine? 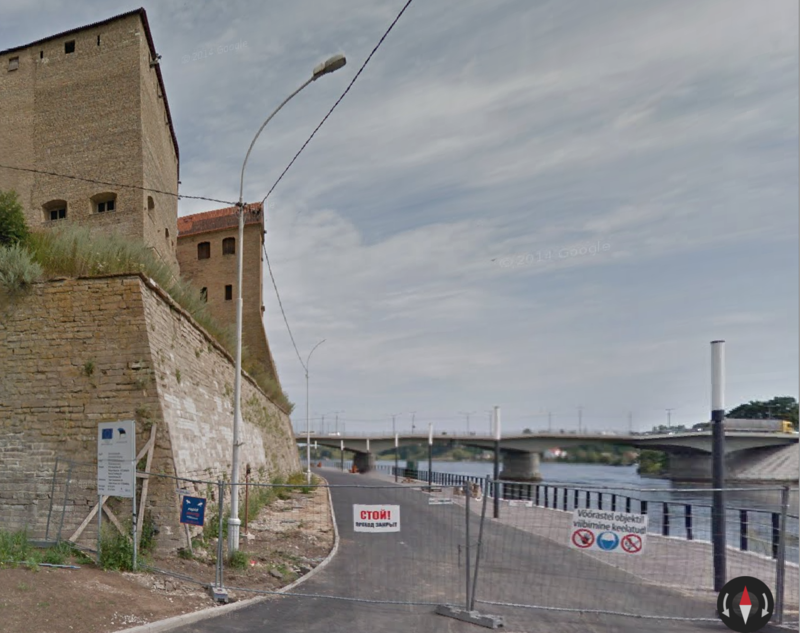 (See map right of the city of Narva, Russia’s border town Ivangorod is on the other side of the River). According to NATO, Putin has a destabilizing influence in the Baltics, and the Cold war is increasingly becoming a Hot War. "Secretary of State confirms proposed AUMF would allow for boots-on-the-ground in fight against the Islamic State"
U.S. Secretary of State John Kerry confirmed on Tuesday that the Obama administration is, in fact, seeking approval for the deployment of ground troops to participate in combat operations against Islamic State forces. At a Senate Appropriations Committee hearing on Tuesday, Kerry clarified the administration's position for boots-on-the-ground soldiers outlined in President Obama'sproposed authorization for the use of military force (AUMF), submitted to Congress earlier this month. The AUMF's wording in relation to ground troops has been criticized as vague and open-ended. The proposed text states, "The authority granted... does not authorize the use of the United States Armed Forces in enduring offensive ground combat operations." As numerous analysts have pointed out, the phrase "enduring offensive ground combat operations" is not a legal term and could open the door to significant troop deployments. At the Senate hearing, Kerry confirmed that the proposal would allow for U.S. combat deployments on the ground but left the parameters ill-defined." Just nine hours after tweeting "Putin annexed Crimea and is now handing over Siberia to the Chinese," and three ours after calling for a "Russian Spring" march, prominent Vladimir Putin critic and opposition politician (who back in 1997 was also deputy Prime Minister of the Russian Federation) Boris Nemtsov, has been killed in the center of Moscow. As The BBC notes, the Russian opposition politician and former deputy PM was shot to death on a Moscow street. Life News is reporting he was shot in the chest four times on a street very close to Red Square. Boris Nemtsov has been shot dead in Moscow. He was one of the most charismatic leaders of the "liberal" or "democratic" "non-system" opposition in Russia (please understand that in the Russian context "liberal" and "democratic" means pro-US or even CIA-run, while "non-system" means too small to even get a single deputy in the Duma). He was shot just a few days before the announced demonstration of the very same "liberal" or "democratic" "non-system" opposition scheduled for March 1st. As I have already explained many times on this blog, the "liberal" or "democratic" "non-system" opposition in Russia has a popular support somewhere in the range of 5% (max). In other words, it is politically *dead* (for a detailed explanation, please read "From Napoleon to Adolf Hitler to Conchita Wurst"). In the hopes of getting a higher number of people to the streets the "liberal" or "democratic" "non-system"opposition allied itself with the ultra-nationalists (usually useful idiots for the CIA) and the homosexual activists (also useful idiots for the CIA). Apparently, this was not enough. 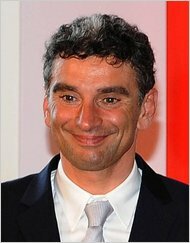 There is no doubt in my mind at all that either this is a fantastically unlikely but always possible case of really bad luck for Putin and Nemtsov was shot by some nutcase or mugged, or this was a absolutely prototypical western false flag: you take a spent politician who has no credibility left with anyone with an IQ over 70, and you turn him into an instant "martyr for freedom, democracy, human right and civilization". By the way if, as I believe, this is a false flag, I expect it to be a stunning success in the West and a total flop in Russia: by now, Russians already can smell that kind of setup a mile away and after MH-17 everybody was expecting a false flag. So, if anything, it will only increase the hostility of Russians towards the West and rally them around Putin. In the Empire, however, this will be huge, better than Politkovskaya or Litvinenko combined. 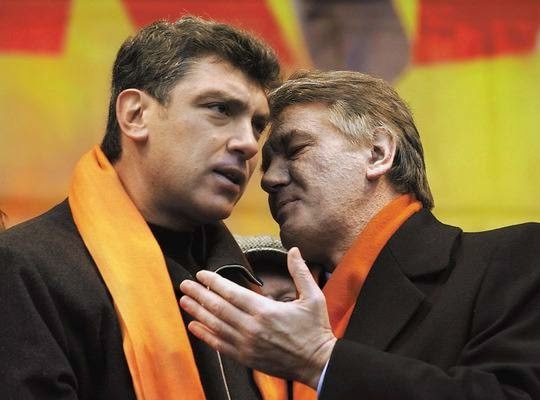 A "Nemtsov" prize will be created, a Nemtov statue will be place somewhere (in Warsaw? ), the US Congress will pass a "Nemtsov law" and the usual combo package of "democratic hagiography" will be whipped-up. As for the "liberal" or "democratic" "non-system" - it will probably re-brand the upcoming protests as a "tribute to Nemtsov" thereby getting more people into the streets. To note quickly two things which I intend to look at more but back to back they seem highly symbolic. Madonna (Black Madonna) tumbles at Brit Awards surrounded by her horned dancers. Next day we see supposed ISIS tumbling down ancient statues and destroying them. 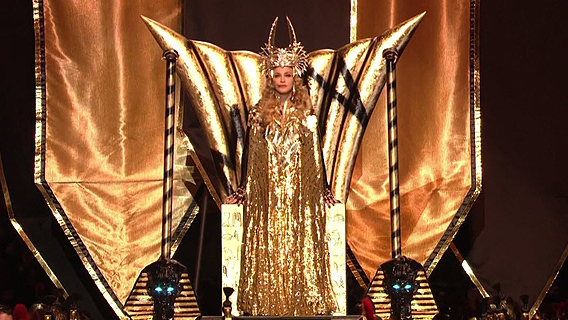 Also remember this at the 2012 Super Bowl Madonna appears in an ISIS like grandeur. This was before the world had ever heard of the supposed terror military machine and state, ISIS. We have to keep the timeline of things in mind. I don't have my full narrative together but so far it seems as if they have setup up symbolically on so many levels ISIS powers, which they perhaps want people to call for their "tumbling" or "taking down" by evoking a global emotional surge against such "horror" (staged as most of it seems broadcast but undoubtable there is suffering on the ground). The Same template is being used. The fundamentalist/military/terrorist ISIS are only doing what the Taliban did funded by you know who. Who managed to achieve a goal of the US by collapsing the former USSR this way be drawing them onto an un-winnable proxy war in Afghanistan by arming the very underpowered Taliban and elevating them to a formidable military force that the USSR then bankrupted itself trying to win. In so doing they are trying to split the entire world then to collapse it. To form it up again, like the phoenix form the ashes. So 2012 was a strong spell casting year with the Superbowl and the Olympic cermonies. 2015 is physical work out of what they hope becomes the subconscious and then outpoured intention of the ignorant(therefore innocent) masses. TO use innocence against itself can never work despite temporal results. Thank you NATO in the name of freedom for someone! It doesn't even have to be a true story it's most likely a que via the MSM for those that know. Nut is a daughter of Shu and Tefnut. Her husband and brother is Geb. She has five children: Osiris, Set, Isis, Nephthys,and Horus. Her name is translated to mean 'sky'[n 2]and she is considered one of the oldest deities among the Egyptian pantheon, with her origin being found on the creation story of Heliopolis. She was originally the goddess of thenighttime sky, but eventually became referred to as simply the sky goddess. Kittens = Cat's revered in Egypt regarded as sacred. France eh! Do you see anything in that article? Another message perhaps? WHy did they use "emiliy" and "london", for the British reader? They are not typical french words and is it the French verison of these English words that are banned? I don't know. If you note the "e" and the "l" are black like the "n" in the normal "nutella" logo. "The Iraqi Army has once again claimed that it has downed a NATO aircraft that was providing military assistance directly to ISIS according to Iranian FARS News Agency. "Harakat al-Hazm, armed with American anti-tank missiles, announces dissolution"
"A U.S.-backed militia in Syria, touted by the Obama administration as a trusted "moderate" group and armed with American anti-tank missiles, is reportedly dissolving following a series of defeats by al-Qaeda aligned Jabhat al-Nusra—leaving the U.S.-led war on ISIS in further disarray. The combatant group, Harakat al-Hazm, had been engaged in fierce clashes with Jabhat al-Nusra for months. The U.S.-allied militia was initially pushed from its northern Syrian headquarters in Idlib and suffered another defeat on Sunday at its new center of operations in Aleppo. "Given what is happening on the Syrian front, offenses by the criminal regime with its cronies against Syria as a whole, and Aleppo specifically, and in an effort to stem the bloodshed of the fighters, the Hazm movement announces its dissolution," declared a statement from the group, cited by Daily Beast writer Jamie Dettmer. The militia announced that its members would join a new coalition—the Shamiah Front—which is engaged in fighting against the regime of Syrian President Bashar al-Assad and, according to Dettmer, is "distrusted by Washington." According to the Guardian's Middle East Editor Ian Black, the front includes "hardline Salafist factions as well as more moderate brigades like the Muslim Brotherhood-linked Mujahideen Army and another U.S.-backed outfit." Harakat al-Hazm is one of many Syrian militias that have received U.S. training and support, including shipments of anti-tank Tow missiles. Unverified reports are emerging on Twitter that their Tow missiles have been seized by al-Nusra fighters:"
what does this have to do with agip? excuse my ignorance, please T, but what is agip? Wow both dead? That's not suspicious at all..